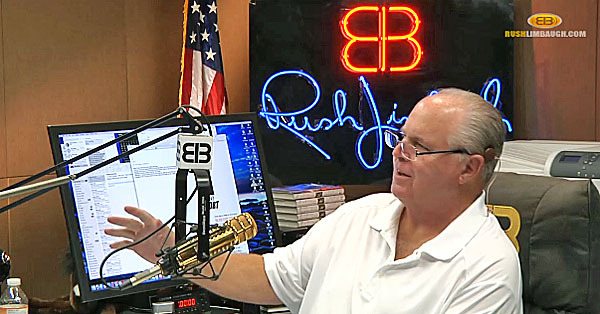 While protests continue over President Donald Trump’s “extreme vetting” of foreigners from seven Muslim-dominated countries, radio host Rush Limbaugh says the commander in chief faces a much more serious problem. “The real choke point here and the real weak point – and I’ve mentioned it a number of times all during the campaign – the real problem Trump has here is not these protesters,” Limbaugh said Monday on his national broadcast. Limbaugh stressed that the protests were not spontaneous reactions to Trump’s executive order barring people from seven Muslim-majority countries from entering the U.S.
“What all of this is about is the preordained, prearranged Democrat Party strategy of unseating Donald Trump and opposing him,” he explained. It didn’t take long for former President Barack Obama to get involved in the issues of his successor. Ten days into the Trump administration, Obama, speaking through his spokesman Kevin Lewis on Monday, heaped praise on the protesters. “President Obama is heartened by the level of engagement taking place in communities around the country,” Lewis said. Lewis continued: “Citizens exercising their constitutional right to assemble, organize, and have their voices heard by their elected officials is exactly what we expect to see when American values are at stake. Limbaugh said Obama’s backing of the protests comes as no surprise. A new poll on Monday indicates most voters approve of President Trump’s temporary halt to refugees and visitors from seven Middle Eastern and African countries until the government can do a better job of keeping out individuals who are terrorist threats. The survey by Rasmussen Reports finds that 57 percent of likely U.S. voters favor a temporary ban on refugees from Syria, Iraq, Iran, Libya, Somalia, Sudan and Yemen. Only 33 percent oppose the ban.